On a sweltering day in June 1440, near the Tuscan town of Anghiari, the simmering conflict between Italy’s principal powers exploded into a battle whereby Florence and the Papal States joined with Venice to defeat the previously unstoppable army of Milan. That battle put an end to Milan’s expansionist aims, brought the Medici family to power, and ushered in the age of the Renaissance. There was, perhaps, no finer evidence of this than a massive painting by Leonardo da Vinci commemorating the Battle of Anghiari, a masterpiece that quickly became famous, inspiring numerous imitations and burnishing the legend of the battle—until it was either lost or destroyed. Until recently, that is, when researchers made a breathtaking discovery of the location where The Battle of Anghiari has been hidden for more than four hundred years. 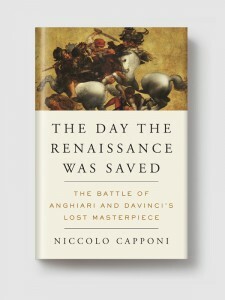 In The Day the Renaissance Was Saved, Niccolò Capponi—a direct descendent of Niccolò Machiavelli, as well as of a Florentine general who was a key strategist of the campaign at Anghiari—weaves the story of the lost da Vinci masterpiece through the narrative of the history-changing battle, and offers context on the development of humanist thought and the political intrigues of fifteenth-century Italy. This is military history, political history, and art history all rolled into one, from a scholar whose ancestors schemed, plotted, and fought alongside the infamous Medicis during a pivotal moment in Western history. NICCOLO CAPPONI is a scholar and a count descended from one of Florence’s most prominent families since the thirteenth century. He has published books on Renaissance Italy, the Spanish Civil War, and the Samurai; has appeared on numerous television documentaries; and teaches political science and history in Florence, where he lives. ANDRÉ NAFFIS-SAHELY is a poet, critic, and translator from French and Italian.